It’s that time of year and everyone is busy shopping for gifts, but you have to wrap all those gifts up too. If you spent all that time looking for the perfect unique gift you should wrap it up in some unique wrapping paper too. 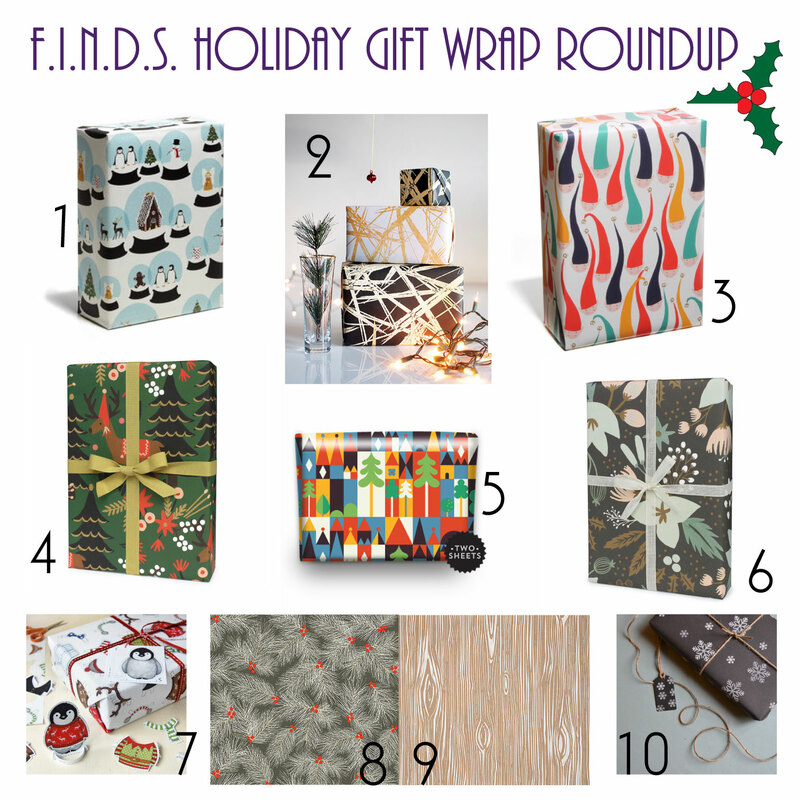 Here is a roundup of some of our favorite gift wraps for the season! #1755 Snow Globes from Snow & Graham – DIY snow globes are all over the place this year so why not add them to your wrapping paper. Gold Strokes Faux Gold Bolts 20”x29” gift wrap sheets by Khristian A Howell – If you are looking to add some glitz and glamour to your holiday this is the perfect wrapping. #1767 Elf Hats from Snow & Graham – Choose this wrapping to add a colorful and whimsical touch to the packages under the tree this year. Reindeer from Rifle Paper Co. – We love the mix of reindeer and trees on the gift wrap and of course it has the signature style that you recognize from Rifle Paper Co.
Anna Dunn folk Town Wrapping Paper from 1973 – Another option to add some color under the tree that is not so traditional. Winter Wonderland from Rifle Paper Co. – We are huge fans of everything Rifle Paper Co. here at F.I.N.D.S. and we love this non-traditional holiday gift wrap. Add a non-traditional element under the tree that still gives that wintery holiday feel. Dress Up a Penguin Interactive Wrapping Paper – Penguins are my favorite animal so I love this, but we think it would be a great gift wrap for the kids. Included gift tags can be cut out to make adorable baby penguin paper dolls and the wrapping paper is full of outfits to dress your penguin up! Faux Bois Wrapping Paper from Paper Source – we love this paired with the Pine Branch on Slate Wrapping Paper. Hand Printed Snowflakes Christmas Wrapping Paper from Not on High Street – I always love snowflakes at holiday time and this is a simple, modern take on a snowflake. Use it all season long.